The Thinking at the Edge Process - thinking-at-the-edges Webseite! APPLIED TAE "Thinking at the Edge"
First, the implicit knowing will be unfolded by articulating and making it communicable (steps 1-9). Starting from a felt sense, holding an implicit knowing you formulate a crux sentence which is still approximate (step 1). Based on a keyword you step deeper into the relevance of the words and the many meanings, which are implicitly functioning. You realize that the ordinary meaning of words does not say what you want to lay out. By asking in a friendly way, “What would you like this word to mean?”, the words can become lively and filled with your own meaning (steps 3-5). During the whole process, particular attention is paid on the more-than-logical indicated by a paradox (step 2). Gendlin says: “Finding a paradox is like a commitment to unfold it. It gives you a feeling of already having it although you do not have it yet”. Coming from your felt sense you will find actual situations as instances. “Because it [the instance] really happened it carries more with it than a rule; a rule has to keep steady”. By paying attention to details you will find new patterns. Further patterns are formed by crossing. Crossing can be seen as taking the pattern of a first instance into the consideration of a second instance (steps 5-8). There is room now to write (step 9). You can say it “short, long, poetic, technical, however you want”. From the unfolding of our implicit knowing new phrases or words arise. 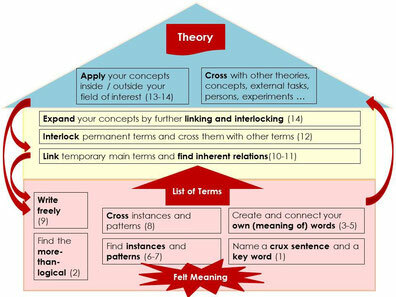 With three of the most meaningful words or phrases, named A, B and C you start the theory. First, you formally say: A is B (step 10). Then you check to see if this feels right, otherwise you go back and change it. Then you ask yourself, why is it right (step 11)? By doing this you find something new and you really understand: Oh yes, A is B. “In the moment we are understanding it conceptually, it also becomes implicit”. By using logic (A is B) you separate what you’ve really understood and which keeps steady from that which implicitly will go forward. That’s why logic is so important. “The possibility to repeat is our science”. Now you define your steady terms by each other (step 12) and you will realize that you need more specifications. You will expand further and further by connecting terms logically (steps 12 and 14). You build your theory by forming and defining more accurate terms and patterns. You might apply your patterns to another field in order to find something more (step 13). It is a crossing of two fields. You first do it formally in saying: some aspects about another field are like my patterns. Some new understanding of the topic in another field and new insights about your topic might appear. The new patterns (concepts) which are formed represent your own truth. It was derived from explicating your implicit knowing, by understanding it conceptually by using logic, and by bringing it back into the body knowing. Gendlin, E.T., (1997). The Process Model. Experienzielles und Logisches Denken - eine Abenteuerreise entlang neuer Ideen und wertvoller Konzepte. New Three-person APPLIED TAE phone courses to start. Besides the APPLIED TAE Basic workshop and three-person phone course, there is now also an APPLIED TAE Intensive. This course goes slower and deeper.